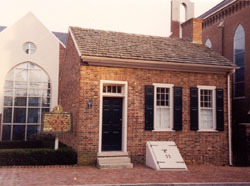 Henry Clay, "the Star of the West" and important 19th-century political figure, began his law practice in this small brick building. The one-story office was built by Clay in 1803 and measures a mere 20 by 22 feet. Born in Hanover County, Virginia, in 1777, Henry Clay grew up hearing orators such as Patrick Henry. Clay studied with Chancellor George Wyth--professor of law and classics at the College of William and Mary and teacher of Thomas Jefferson and John Marshall. Completing his law training in the office of the state Attorney General, Robert Brooke, in 1797, Clay decided to follow his mother to Kentucky, and eventually settled in Lexington. Clay occupied this law office from 1803 to 1810 during which time he was elected to two successive terms in the Kentucky Legislature and also to fill unexpired terms in the United States Senate. Later in his career, Clay served as a United States Congressman, Senator, Secretary of State, and ran for the presidency three times--losing only by a slim margin in the election of 1844. The law office is not only historically significant because of its early occupant, but also as one of the few early, professional buildings remaining in Lexington. In 1830, the law office was incorporated into a larger building, and the originial roof was removed. The State of Kentucky purchased the building in 1969 and the 1830 additions were carefully demolished, revealing the building's original 1803 configuration. A careful restoration was undertaken and completed in 1971. 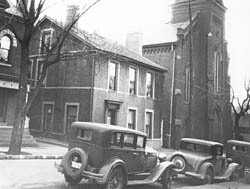 The law office is presently owned by the First Presbyterian Church. Henry Clay's Law Office is located at 176 North Mill St. just south of Gratz Park. It is not open to the public.